‘Beyond Heaven’s Door’, by bestselling author and pastor Max Lucado, is a short read with a big impact. It will dispel your mortal doubts and launch your spirit heavenward. In his unusual conversational and accessible style, Max Lucado has written this book as a comfort to those in fear of their eternal destiny. With his trademark humour, mini stories and ability to connect biblical truth with humility and grace, Max reveals everything we need to prepare our hearts and minds for heaven. This book is formatted so you can dip in and out at your own leisure. There are no lengthy chapters, no tiny font size and no endless theological explanations. Each chapter in ‘Beyond Heaven’s Door’ is no longer than 4 pages including pictures, relevant Bible verses and nicely formatted text pleasing to the eye. With this helpful and comforting book, readers will surely find firm footing to start living out eternity early. ‘Beyond Heaven’s Door’ would make a delightful gift to anyone fearing death, searching for answers about heaven or those looking for a good, insightful read. After 25 years of writing books, Max Lucado has sold more than 80 million book. Max is the only author to have won three Christian Book of the Year awards—‘Just Like Jesus’ (1999), ‘In the Grip of Grace’ (1997), and ‘When God Whispers Your Name’ (1995). In 2005, Reader’s Digest magazine dubbed him “America’s Best Preacher” and in 2004, Christianity Today magazine called him “America’s Pastor.” Max’s writes in a range of different formats including adult books, gift books, children’s titles, Bibles, commentaries, calendars and devotionals. Max Lucado is also the Minister of Preaching at Oak Hills Church in San Antonio, where he has served since 1988. He has been married to Denalyn Preston Lucado since 1981, and they have three grown daughters—Jenna, Andrea and Sara—and one son-in-law, Brett. 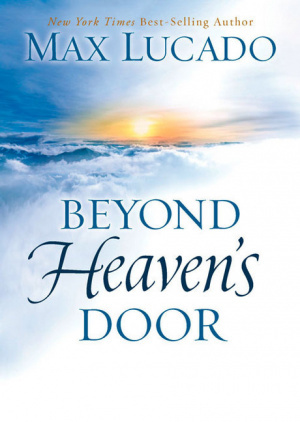 Beyond Heaven's Door by Max Lucado was published by Thomas Nelson in February 2013 and is our 9209th best seller. The ISBN for Beyond Heaven's Door is 9780849948435. Be the first to review Beyond Heaven's Door! Got a question? No problem! Just click here to ask us about Beyond Heaven's Door. Thoughts of heaven can be unsettling. Life with no end? Space with no bounds? Are we supposed to feel good about these things? Bestselling author Max Lucado assures us that we can. There is much about heaven that we don't yet understand. And while thoughts on our final destiny may stir questions, they needn't stir our fears. In Beyond Heaven's Door Max takes us on a journey from finding certainty in our destination to God's great promises of the hereafter. Open the door and catch a glimpse of the joy that awaits you in heavenand find hope for today in the process. Not sure whether this book is for you? Wondering whether it’ll be a great gift for a friend? Or are you just curious? Read on for a closer look inside this book. The book isn’t a heavy, dusty tome that will take up most of your shelf space. It’s a little, tiny, delicate book that looks well suited resting on a coffee table or standing against a computer screen on an office desk. When opened you’ll discover soft, warming tones across each page. With light browns, subtle oranges and large text it becomes a joy to pick up and read. Within each of the 20 chapters are pictures to rest your eyes from words and cleverly formatted text to your eyes satisfied and hunger for more. In the second chapter rose petals form the end of a Bible reading and in the third chapter (based on clothing) a railing full of coat hangers begin the reading and clothes pegged to a washing line end it. These visuals help Max’s reading dig deeper into your memory and make his insightful teaching hit home. The book isn’t for reading in one chunk, with wordy theology and swirling arguments that over complicate rather than make it clear. It’s easy-to-read, quick chapters make ‘Beyond Heaven’s Door’ a devotional book to dip in an out of in your own time and in the places you want. Each short chapter will take no longer than 3 minutes to read, with engaging story that are enriched with cracking Bible verses. Read in a devotional way, this book has untold potential to impact your day when you need it. Say you’ve had a rough day at work, or you’ve got a big decision to make, or your mind is swirling with doubt, fear or anxiety. Let Max calm your thoughts and centre your soul on what’s important – your journey heavenward. “Not all those who say ‘You are our Lord’ will enter the kingdom of heaven.” – Matthew 7:21, NCV. “… know beyond the shadow of a doubt that you have eternal life.” – 1 John 5:13, The Message. “The Lord makes me very happy; all that I am rejoices in my God. He has covered me with the clothes of salvation and wrapped me with a coat of goodness.” – Isaiah 61:10, NCV. “Live in him so that when Christ comes back, we can be without fear and not be ashamed in his presence.” – 1 John 2:28. “Our righteous acts are like filthy rags.” – Isaiah 46:6, NCV. “But clothe yourselves with the Lord Jesus Christ and forget about the satisfying your sinful self.” – Romans 13:14, NCV. “You were all baptised into Christ, and so you were all clothed with Christ. This means that you are all children of God through faith in Christ Jesus.” – Galatians 3:26-27, NCV. If you enjoy a Lucado book, this will not disappoint. If you enjoy spending time with God in the morning with a cup of coffee (or green tea in my case), this will be a refreshing change. If you need some comfort, this will focus your mind and heart. If you need a pick-me-up, Max will brush off the troubles of the day. I like it, and I think you’ll like it too.